We received a case question from a field doctor today. Q: I have a pt. 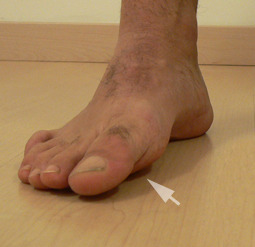 that demonstrates pretty classic Rothbart foot with forefoot compensated varus – sesamoid pain of digit 1. She is a dancer as well which obviously complicates things. Would you generally post under the first MT and try to bring her more medial on her foot with a lateral heel post or just post the first MT in her day shoes? Rothbart’s foot is a difficult foot type. We would consider it an underdevelopment issue. The first metatarsal is typically short, elevated (referred to as metatarsus primus elevatus) and supinated (if you are looking down at your own right foot, it is spun clockwise). This, as you can see all 3 components in the picture, leaves a very incompentent first toe. Many times, if the ankle and subtalar joints are in neutral positioning the first metatarsal (MET) head doesn’t even touch the ground. The problem is that the foot does not work well that way ! So, the owner will typically spin the foot outward into external rotation ( we will show this in a video we will attach later tonight that will help the understanding of this issue, it is important) in order to shift the tripod to help find grounding of the first MET onto the ground. The problem is that in this foot type, the grounding is not entirely complete. Thus, what Rothbart did, wisely, was devise a Rothbart wedge. This wedge slid in from the medial side and basically brought the ground up to the elevated and spun metatarsal. Background info: Under the 1st MET are 2 sesamoids, like tiny patellae, that improve mechancial advantage to the first metatarsophalangeal joint (MTPJ). The short flexor to the big toe , the flexor hallucis brevis (FHB) has these 2 sesamoids embedded within its tendon, and when paired with a well orchestrated movement pattern between the long big toe flexor (FHL) and FBH as well as the long and short extensors (extensor hallucis longus and brevis, EHL, EHB) and some assistive means from the abductor and adductor hallucis muscles the 1st MTPJ joint can adequately dorsiflex (extend) the big toe to its necessary range of 40+ degrees so we can toe off properly from this medial aspect of the toe. In your case Doc (assuming this is yet another foot from the Joffrey Ballet Dance company that we worked for) placing a wedge under the first MET is not possible in dance slippers. IT will help him/her in their daily shoes but as you know we are merely supporting the deformity. What we would suggest is making every attempt, in addition to the supportive help at this time, to improve their ability to plantarflex the first metatarsal. How do you do this ? This works well on Forefoot varus feet that are flexible and have some skills left in their playbook. Increasing the skill, endurance and strength (our 3 tenants, S.E.S.) of the extensors (both short and long, EHL & EHB) will help to drop the first metatarsal into plantarflexion. So will improving the pull up on the other end of the metatarsal base, ie. tibialis anterior, posterior etc. Many insufficient feet do not have adequate extensor strength to the toes. This creates many anterior compartment syndromes (shin splints etc). In this case, you could try to improve extensor strength but you will have to make sure they can get adequate function of the short hallux flexor (FHB) to help anchor the sesamoids if they can get them more purchase on the ground. We would use our therapy approach. Treat the wedge as an orthotic (for the big toe!). Place the wedge sufficient in size to reduce their medial foot collapse. Initiate the protocol above, and as improvements are noted in S.E.S. then begin to reduce the degree and amount of the wedge correction. We use a grinder in our offices, but sandpaper or a nail file will do the job, it is why we use a cork-type product. Supporting this foot type with a high arch bearing device will artificially help reduce the bio-implosion issue to the body posture, but those supportive structures would do well with improved S.E.S. as well. The problem with a high orthotic is that it will maintain the metatarsus primus elevatus issue (raise 1st MET) and they will have to pronate even harder through the forefoot. This will not be good. In some cases we will implement a custom rearfoot varus wedge ground in our office to be precise, to help reduce the rearfoot pronation that may be employed by the client to help the medial foot on the ground. But, from what we are imagining here in our heads, we think the forefoot implementation and homework is the first way to go. Placing a thin sheet of EVA foam under the MET head might also soften the blow on that inflammed sesamoid in the mean time. The Gait Guys hope this helps a bit, perhaps opening some other thoughts for treatment on your end or more pointed future questions on this case. Tune in again in case we hear back. We will see if we can put a little video together that will support this dialogue, it makes it so much easier to digest.